The dance mania was fueled by a large number of themed events. One concept that proved to be particularly successful was the “tango tea” or “thé dansant.” (Reisenweber’s claimed to have imported the idea from Paris.) Since male dancing partners were provided by the establishment, these afternoon tea dances became popular with women whose husbands and fathers were at work and none the wiser. Reisenweber’s hosted the city’s first such dance in January 1913, a seminal event documented by one of the cards shown below. Other themes appear only once, such as a baby contest designed to lure young mothers out of their nearby apartments on the Upper West Side. 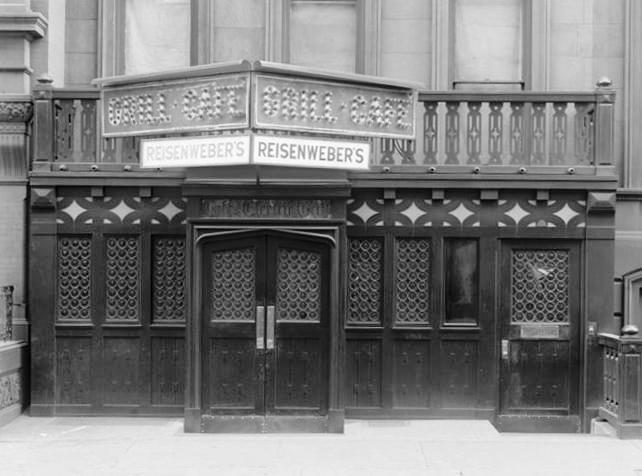 Reisenweber’s utilized four stories of its ornate building for its dining and entertainment operations. The complex included seven dance floors, a stew of frenzied activity that gave rise to the cabaret in the United States. Indeed, it was the first restaurant to present a show with more than one act. The format was soon adopted at places like Rector’s in the theater district on Broadway. 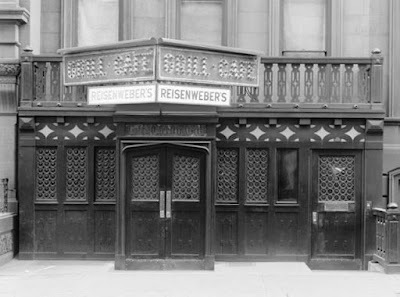 And when Reisenweber’s and the other cabarets closed in the 1920s due to Prohibition, the festivities continued at the speakeasies where advertising was done by word of mouth. 1. Soon after the Original Dixieland Jass (sic) Band made its acclaimed debut at Reisenweber’s 400 Room, it released the first jazz recording in February 1917, a turning point in popular culture that ignited the Jazz Age. 2. Austrian-born Louis Fischer took over the management of the well-established restaurant from his father-in-law, John Reisenweber, in the early 1900s. After expanding in 1910, Fischer took the business in new directions. 3. New York Hotel Record, Vol. 12, No. 10, 3 February 1914. 4. New York Times, 10 August 1931. What a treasure trove of material! And the video was fun to watch, although I did regret being unable to peruse the menus at my leisure. Fabulous! Love the warning about the hazards of out-of-date dance steps. Henry--Great material both historically and gastronomically, and visually most appealing. Many thanks for sharing! Please include the address of the establishment..so I don't have to look up every time I read about one..I have no idea where this place is or was. Thanks! What a great blog! kudos!!! who knew/?? Such an amazing collection. It's fun to come across this. John Reisenweber is my great-great grandfather. We're fortunate to have a couple of the original menus in our Reisenweber family memorabilia. Thanks for your interest. My grandparents, Al B. White and Myrtle Young, performed at Reisenweber's. I have an undated flyer that advertised their performances! I have a question about the location of the original Reisenweber's. It's referred to as Columbus Circle in NYC (and as a lifetime NYCer I know that to be 59th Street and Eighth Ave at the southern end of Central Park). However, elsewhere I see that "Columbus Circle" Reisenweber's location to be 48th Street and Broadway in the Theatre District. To my knowledge, Columbus Circle was never 10-11 blocks further south than the location is has been known by for several decades. Can you please clarify the location of the original Reisenweber's?